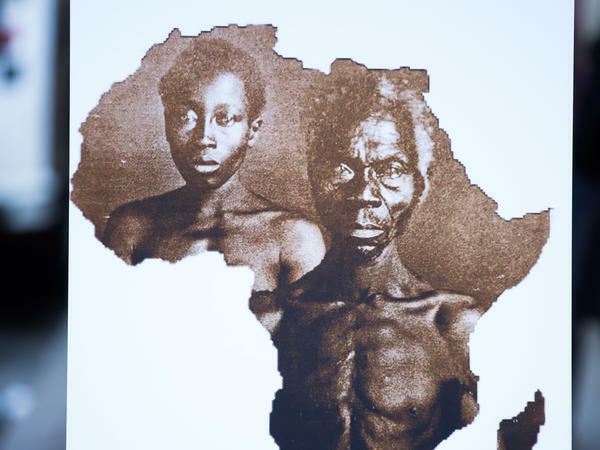 A sample image of "Papa" Renty and his daughter Delia, taken in 1850, are displayed during a press conference announcing a lawsuit against Harvard University on Wednesday in New York City. Lanier says that Harvard has no rightful claim to the images of Renty or his daughter, Delia, forced to strip naked and pose for a demeaning pseudoscientific study. Lanier argues that in refusing to acknowledge Lanier's claim to the photos, Harvard is "perpetuating the systematic subversion of black property rights that began during slavery and continued for a century thereafter." "Slavery was abolished 156 years ago, but Renty and Delia remain enslaved in Cambridge, Massachusetts," the complaint states. "Their images, like their bodies before, remain subject to control and appropriation by the powerful, and their familial identities are denied to them." A Harvard spokesperson said the university couldn't comment as it had not yet been served with the complaint, the Associated Press reported. Harvard is the latest school to face accusations that it's benefiting from a racist past. In 2017, Georgetown University apologized for selling 272 slaves in the early 1800s and promised to make reparations by offering the descendants of enslaved people an edge in admissions. And in 2016, Harvard Law School abandoned its official seal, based on the crest of a slave owner whose endowment of land helped establish the school. Lanier's complaint alleges Harvard is still deriving the indirect profits of slavery. "The claim is simple," Josh Koskoff, one of Lanier's attorneys, told The Washington Post. "You took something. It doesn't belong to you. It belongs to me. And I want it back." The complaint tells the story of Lanier's family, passed down from one generation to the next in oral tradition, starting with Renty — a slave in South Carolina who taught himself to read in defiance of state law. Lanier juxtaposes her family's history with that of Harvard and its relationship with professor Louis Agassiz. The way Lanier tells it, Agassiz was obsessed with proving the superiority of white people. Shortly after the Swiss natural scientist arrived at Harvard, he began to promote the theory of polygenism — the now-debunked idea that racial groups don't share a common origin. It’s time for @Harvard to return Papa Renty’s derogatory slave photos to his family and stop using them for the institution’s gain. To help prove his theory, Agassiz commissioned a series of photographs of several enslaved men and women, made using an early photographic technique known as daguerreotype. They were to stand naked and be photographed from all sides. One of those men was Renty, staring at the camera, his eyes blazing. As Renty's image was being used without his consent to help prove Agassiz's theories, Lanier says, Harvard was reaping the fruits of its professor's growing reputation. Even today, Harvard uses the image on the cover of a publication about anthropology and photography, and projected it onto a giant screen at an academic conference in 2017, the AP reported. "That photograph is like a hostage photograph," the writer Ta-Nehisi Coates told The New York Times. "This is an enslaved black man with no choice being forced to participate in white supremacist propaganda — that's what that photograph was taken for." Despite the oral history, it could be hard for Lanier to definitively prove she is a descendant of Renty. Furman University Professor Gregg Hecimovich told The Times "it would be very hard to make a slam-dunk case that she believes she has." Nonetheless, Lanier has asked for a jury trial to make her case. She wants compensation for pain and suffering. She wants punitive damages. And she wants Harvard to hand over the photos. "It was an act of both love and resistance that Renty and Delia's kin kept their memories and stories alive for well over a century," the complaint says. "It is unconscionable that Harvard will not allow Ms. Lanier to, at long last, bring Renty and Delia home." An earlier version of this story misspelled the name of writer Ta-Nehisi Coates as Ta-Nehisis.